QUESTION: Hi I have type 2 diabetes and wake up with a very high number as high as 300 why? ANSWER: The reason your morning blood glucose levels are as high as 300 is your "DIABETES", because your body insulin is not functioning well. What you can do is to control what you eat at dinner. Let's say, try not to eat high carb foods, or too much food for dinner. It is better if you do not overload your body with carbs to keep your blood sugar under control. Soups or salads or foods high in proteins or complexed sugar are much encouraged. Try to eat at least 4 hours before going to bed to give time to your body to assimilate the calories and nutri-elements in the food you had for dinner. Thus, it will be easier for your body to keep and wake up with normal blood glucose levels. Wake Up With Normal Blood Sugar! QUESTION: Is there anything I can do to wake up with normal blood sugar level? My fasting sugar levels are always high. 1. First of all, remember that the normal fasting blood glucose level is up to 100mg/dl or 6.1mmol/l, depending on the unit of measurement. However, if you are diabetic, the acceptable fasting blood glucose levels are between 90-130 mg/dl or 4-7mmol/l. 2. 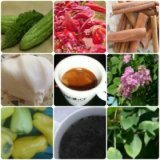 In purpose to maintain your blood glucose within the mentioned ranges, you have to do several things. The most important of them is to have a normal bedtime blood glucose by minimizing the amount of carbs acquired at dinner. Keep in mind that you are not totally excluding carbs from your dinner; but, just minimizing the amount of their intake. If you exclude the food which are containing carbs from your dinner, your blood glucose level will collapse, and you may lose consciousness. - fruits, vegetables and fish. As not all of the vegetables are suitable for diabetics, you have to exclude potatoes from your diet. However, if you are person who loves potatoes, you can eat potatoes once a week. With regards to fruits, there are several types, which are containing a lot of carbs and you are supposed minimize their intake, including strawberry, grape and mango. Fish is the most healthier kind of meat for patients with diabetes. This does not mean that you are not supposed to eat only fish, because this will drastically change your metabolism. Try to eat fish at least 2-3 times in the week, the other days you can eat chicken or turkey (the breast part preferably). 3. Regarding the meals, it would be great for you to eat your dinner 3-4 hours before going to bed. In this way you are going to ensure your organism enough time to metabolize the glucose. However, because of the early dinner, which is with limited carbs at the same time, you have to eat your breakfast 20-30 minutes after waking up. In this way, you can avoid to have too low fasting blood glucose. 4. Something very important for every person, especially for diabetics, is to educe the stress. Stress stimulates the central nervous system and respectively the whole organism, in a bad way. Generally, stress leads to increased secretion of adrenalin and noradrenalin, which causing a lot of things, but one of the most important is the blood glucose elevation. This elevation is not connected with the diet or something else and because of this, you are supposed to try to be more temperate. Important stress reduction remedy, which is improving at the same time your metabolism, is by doing sports. Try to walk in the park for about 1-2 hours in the evening, or run for 30 minutes. This will reduce the effect of the stress and help you will the glucose problems. As you probably know, when you are doing exercises you are using a lot of energy. This energy is provided by the glucose in your blood, and doing sports is leading to its reduction. 5. The most important thing in your situation is to take your medications regularly. It would be better to make a consultation with your doctor every month, for therapy adjustments. Remember to show your doctor the result of the blood sugar monitoring, because this will give him the exact picture of your glucose metabolism and blood sugar control during all these days. 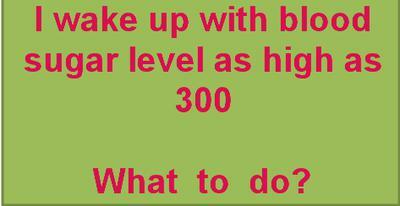 Comments for Why do I wake up with blood sugar level as high as 300? You are uniformed. High morning glucose is generally due to the liver dumping high levels of glucose while you sleep in response to dropping blood glucose levels. So your recommendation will not work. The most effective thing i have found is to eat a late night or midnight snack that is high in protein and below 15 carbs - greek yogurt is a good option. Thank you for your sincere opinion. I am happy you have found a solution to your high blood sugar levels in the morning. In fact, it is difficult to explain medical issues with non-medical auditorium. Now, when it comes to high morning blood glucose, we want to understand/determine what the cause is. So, the very first thing is to monitor your blood sugar levels (bsl) even during night time. This is to see if the drop in bsl really occurs during night. Now, if you go through my recommendations, I emphasize the advice of non eating foods high in carb to avoid such drops at night-time. I too advise to have low carb high protein foods at dinner. I also suggest to have dinner at least 4 to 6 hours before going to bed in order to be able to measure your bsl and evaluate the oscillation (if dropping or getting high). Based on the results, you can take a snack at bedtime. It is also true that morning bsl are also being affected by morning hormones and dosage of meds apart what you consume at dinner or bedtime. I recently checked up ones and found out, my fasting blood sugar is 195. I have never been diagnosed with diabetes but I have a diabetic family member. As you have a family member diagnosed with diabetes you are predisposed to develop diabetes. This means that you need to do frequent check-ups of your blood glucose levels. To be sure if you have diabetes or not you need to repeat the test several times at least three times. Also, before doing the test make sure not to drink anything. Some people when say fasting consider only the eating process but you should not drink anything else just water. Eat dinner early and eat less than usual avoid coffee and drugs that may interfere with the test result. You can control your blood glucose levels by diet and exercise only if you are prediabetic patient. Repeat the fasting glucose test three times. If the numbers are higher than 125 than you may have diabetes and HbA1 test must be done to be sure for the diagnosis. If the numbers are between 100 and 125 then you have prediabetes and things are much more simple. Diabetes is manifested with some specific symptoms not just with an elevation of blood glucose levels. Frequent urination, thirst and weight gain are some of the usual symptoms of diabetes. Mention to your doctor if you have any.